Accessible after clicking "Enter" on the splash/video page. The only content on the main Project Abraham splash site is a video that can be downloaded directly here. The third video appears, and can be downloaded directly here. The countdown ends, providing a link to the voting interface - to view dossiers, the PA inbox, and the first vote. Voting ends, and Brown is chosen as the next injection candidate. 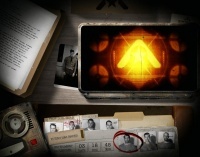 His dossier is updated with numerous item, a new video is available, and an audio message from Cassie. The Inbox also has two new letters. Results of Brown's injection are available in a new video. Dossiers for Brown, Danby, Gennaro, Hale, Khaner, and Oster contain new items. The Inbox also has two new items, and the second vote is open. A Contact page also appeared, linked in the upper right, which simply asks for a Name, Phone, and Netmail (email address); this appeared along with a link that directs to Getawarjob.com. This page was last modified 18:41, 22 September 2008. This page has been accessed 67,703 times.